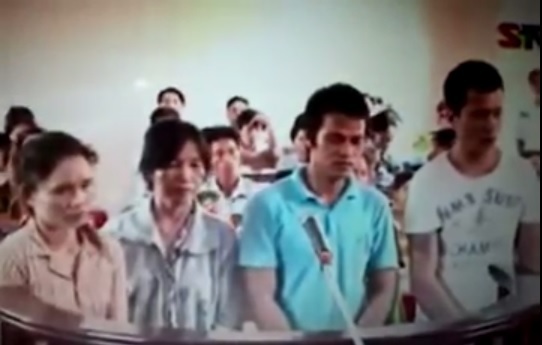 Vinh Chau, Soc Trang, 26th September 2013 – Four Khmer Krom people were trialed on 25th September 2013 have been handed a one year sentence for speaking up on behalf of Abbot Ly Chanh Da, who has fled to Thailand seeking asylum. Screenshot of Prey Chop Trial on 25th September 2013. Accused of creating “Public disorder”, Lam Thi lon, Ly Thi Danh, Ly Minh Hai and Tang Pha Lan was simply exercising their right to speak and standing up for what they thought was right but have been instead treated as criminals. The Khmer Krom people had no legal representation or lawyer present to represent their side of the story. Instead they were most likely to coerce into the submission of guilty plea deal as a means of getting a lighter sentence. One year may seem like a light and fair sentence based on the fact that the accused gave “honest confession, are of ethnic Khmer with low education, limited legal awareness”* but in actually fact is a heavy sentence for the four accused. One year in prison means a year of isolation and torture for “beating a drum to alert local villagers that Vietnam authorities were defrocking one of the monks at Prey Chop temple”. Instead of being called to the police station and given a warning and or fine, the individuals were arrested and imprisoned, given an unfair trial and sentenced to one year. News from the Villagers from Prey Chop revealed sixteen others have been fined $60 for participating in the so called” Public Disorder” incident. According to inside news from Ta Sek temple, a lawyer hired by the family of one of the accused was told via a Vietnamese police officer that the Venerable Lieu Ny, Venerable Thach Thuol, Thach Phum Rich, and Thach Tha refused to use the lawyer.The lawyer did not even have a chance to see or speaker directly with the accused. It is yet another example of a legal system that remains unfair and discriminates against the Khmer Krom. The charge of “Public Disorder” remains a powerful tool in which Vietnam authorities use for political prosecution and silencing of dissents. PLEASE COME BACK FOR MORE UPDATES ON TOMORROW TA SET TRIAL. 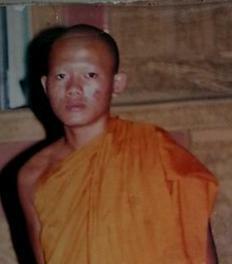 Venerable Lieu Ny, Venerable Thach Thuol, Thach Phum Rich, and Thach Tha have been arrested since May 20, 2013. The Vietnamese authority just notified their family this week, giving them insignificant time to find a lawyer to represent the accused. It seems that Vietnamese government has decided to provide a trial just to sentence and punish them. According to the summoned letters that Vietnamese authority asked the Khmer-Krom to attend the trial, it states that “Venerable Thach Thuol and his accomplices” will be trialed for the alleged crimes of: “fleeing abroad to against the Vietnamese government” and “organizing for other people to fleeing abroad”. were arrested with their two Khmer-Krom youth students: Thach Phum Rich and Thach Tha. Ask Vietnam to provide a transparent trial that is free and fair so they could be released because they did not commit any crimes. Urge Vietnam to provide Lawyers to help represent Venerable Lieu Ny, Venerable Thach Thuol, Thach Phum Rich and Thach Tha at the court. Urge Vietnam to allow Venerable Lieu Ny, Venerable Thach Thuol, Thach Phum Rich, and Thach Tha to defend for themselves by speaking if they don’t have lawyers. On May 28, 2013, the Khmers Kampuchea-Krom Federation (KKF), represented by Mr. Hoang Duong, and Degar Foundation, represented by Mr. Kok Ksor, met the Country Officers of the U.S. Department of States (U.S. DoS). The meeting started from 11a.m. to noon. During the meeting, Mr. Hoang Duong informed the Country Officers of the U.S. DoS regarding to the recent religious oppression that the Vietnamese Authority just committed against the Khmer-Krom Buddhist monks: Venerable Ly Chanh Da of Prey Chop temple; Venerable Lieu Ny and Venerable Thach Thuol of Ta Set temple, in Vinh Chau district, Soc Trang province. On behalf of KKF, Mr. Mr. Duong urged the U.S. DoS for intervention to urge Vietnam to release Venerable Lieu Ny and Venerable Thach Thuol without any conditions and allow Venerable Ly Chanh Da to re-ordain as Buddhist Monk. Mr. Duong also conveyed KKF’s support of the statement of Chairman Ed Royce of the House Committee on Foreign Affairs Committee calling on the Secretary of State to place the Socialist Republic of Vietnam on the list as a “Country of Particular Concerns” with respect to violation of religious freedom and abuses against Khmer-Krom monks and the Khmer-Krom people in the Mekong Delta (South Vietnam). On May 16, 2013, Vietnamese Authority sent Police to arrest Venerable Ly Chanh Da at Prey Chop temple, Prey Chop commune, Lai Hoa village, Vinh Chau district, Soc Trang province. The police took him to local police station in Lai Hoa village, defrocked him. According to a Khmer-Krom woman in Prey Chop commune, she told VOKK Internet Radio (vokk.net) that the villagers went to the local police station in Prey Chop commune and saw Ven. Ly Chanh Da was thrown outside of the Police station unconscious. He was wearing a T-shirt and a short pant. The villagers took him back to one of the villagers’ house, helped to make him to become conscious, and dressed him up with the Buddhist rope. When he was awake, he could barely talk and told the villagers that he was tortured and injected two shots under his arms, then he felt unconscious. There are many polices are now in the Prey Chop temple. The Vietnamese Authority does not allow Ven. Ly Chanh Da to go back to his temple. He is staying at the villager’s house now. He is in a very bad health condition. Sometime he cannot even remember his own name. Mrs. Lam Thi Xang Lan and Mrs. Ly Thi Danh were arrested at their home and taken to imprison in Soc Trang province. Mrs. Ly Thi Sa Bon was summoned, arrested, and imprisoned at the prison of Vinh Chau district, Soc Trang province. The Vietnamese authority arrested the above three Khmer-Krom women because they supported Venerable Ly Chanh Da. They do not want Vietnamese authority to defrock Ven. Ly Chanh Da because he does not violate any Buddhist rules. Provide medical treatment for Venerable Ly Chanh Da. If something happens to Venerable Ly Chanh Da, the Vietnamese authority must be responsible for it. Allow Venerable Ly Chanh Da to go back to his temple. 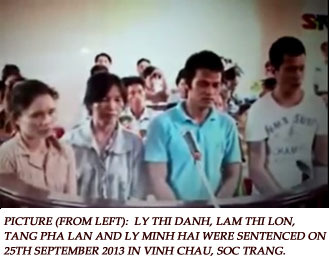 Release Mrs Lam Thi Xang Lan, Mrs. Ly Thi Danh, and Mrs. Ly Thi Sa Bon immediately without any condition. On April 12, 2013, Mr. Ly Chhuon, an Editor-in-Chief of the PreyNokorNews magazine in Cambodia, his wife and his daughter left Phnom Penh, Cambodia, to visit his relatives in Kampuchea-Krom (Mekong Delta) during the Cambodian New Year. His family wants to celebrate Cambodian New Year with his relatives in his homeland. When Mr. Ly Chhuon and his family arrived at the border of Cambodia and Vietnam, they were not allowed to enter Vietnam and had been searched by the Vietnamese custom officers. They have been interrogated, detained and their whereabouts are still unknown. There were many cases that the Khmer-Krom abroad had been issued the Visa to visit their relatives in Mekong Delta, but when they arrived at their airport, they were denied to enter Vietnam. On March 22, Mr. Son Subert, an adviser to the King of Cambodia, and his friends were stopped at the border and not allowed to enter Vietnam even they had Visa issued by the Vietnamese Embassy in Cambodia. Mr. Son Subert planned to travel to Vietnam and visit his relatives in Preah Trapeang (Tra Vinh) province. When the Khmer-Krom people visit Vietnam, they have always been interrogated at the airport or the border. While visiting their relatives, the Khmer-Krom people always face intimidating situations. For example, the Vietnamese authority sends Polices (without wearing uniform) pretending to visit them. The Police start questioning about the activities of the Khmer-Krom abroad. Some time, the Vietnamese Police even ask the Khmer-Krom to work as secret agents for the Vietnamese government to monitor the activities of the Khmer-Krom abroad. It is time for Vietnam to stop violating the basic human rights against the Khmer-Krom. The Khmer-Krom abroad should have their rights to freely visit their homeland. They should not be denied entering Vietnam. They should not be interrogated or detained either.